This year Nightcliff Seabreeze Festival, Environment Centre N.T. and Lakeside Drive Community Garden committed to working together to reduce the waste going to landfill from the festival. 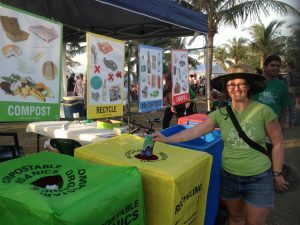 With the help of a City of Darwin grant we developed some clear bin signage, purchased bright bin covers and set up three eye catching Waste Wise stalls that were staffed by eleven fabulous volunteers on the day. Celina, the Stalls Coordinator from Seabreeze had been working behind the scenes with stall holders to reduce the amount of single take away containers. Plastic straws were replaced with paper straws. Plastic water bottles were swapped for water refill stations and recyclable water cartons. Stall holders were encouraged to use ‘backyard compostable’ plates and cutlery made from organic materials. The beer tent provided their cold beverages in reusable plastic cups. All of these measures dramatically reduced the amount of single use plastic that was used at the festival. Lakeside Drive Community Garden committed to collecting the organic matter from our green, organic bins to turn into compost for our garden. Most of the 174kg of food scraps came from food preparation by the stalls and unsold leftovers. We also collected one wheelie bin of plates, cutlery, skewers, napkins, paper and cardboard for composting. Some of these products are some what experimental and it will be interesting to test how quickly and efficiently they breakdown in our backyard compost set up. On the day we had many valuable conversations with the general public about recycling, composting techniques and the broader activities of our community garden. Many people were appreciative of the work we were doing and were keen to help out by separating their waste and disposing of it correctly. This was evidenced by the very low contamination rates of our green bins (less than 0.01%). The following Sunday a bunch of our keen compost volunteers met up again at the garden to weigh our food scraps and build our compost piles. We used a lasagna technique, alternating the wet, green ‘nitrogen rich’ food scrap layers with dry, brown ‘carbon rich’ hay. We used twice as much of the dry brown materials as the wet green materials. We watered our piles in and gave them a good turning with the pitchfork to aerate them. Now, besides monitoring the progress of the decomposition and turning the piles regularly to add oxygen (every 3-7 days) we can sit back and let the bacteria, fungi, worms, beetles and other microorganisms do the work. We hope to have nutrient rich, organic humus to build our raised garden beds with in about 6-8 weeks. The original soil at the Lakeside Drive Community Garden site was very poor; acidic, compacted, lifeless and with low water retention properties. The additional material that we add through compost, manure and mulch is key for building up healthy soil and growing healthy, resilient and productive food plants. 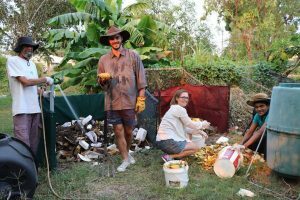 If you are keen to get started with your own compost pile we have developed a handout Backyard Composting . If you are not ready or in a situation where you can recycle your own food scraps, check out Share Waste. It is a site that helps people with excess food scraps find nearby households with composts and/or chickens. Remember, healthy soil is key for growing healthy plants and healthy people.